"I feel proud that I am able to provide employment to those who didn’t have work." Durga Maharjan, a very inspirational craft producer from Kathmandu, Nepal, doesn't hide her proud smile. She has recently won an award for being one of the best cloth suppliers for the Association of Craft Producers (ACP), a non-profit organization who supports Nepali artisans to start their own business and get a regular income, especially after the Nepal earthquake. 85% of these entrepreneurs are women like her. Described as a perfectionist by her relatives, Durga decided to set up her own workshop at home almost 10 years ago and trained all her sisters and sisters-in-law so as they could have a qualified profession and a regular source of income. 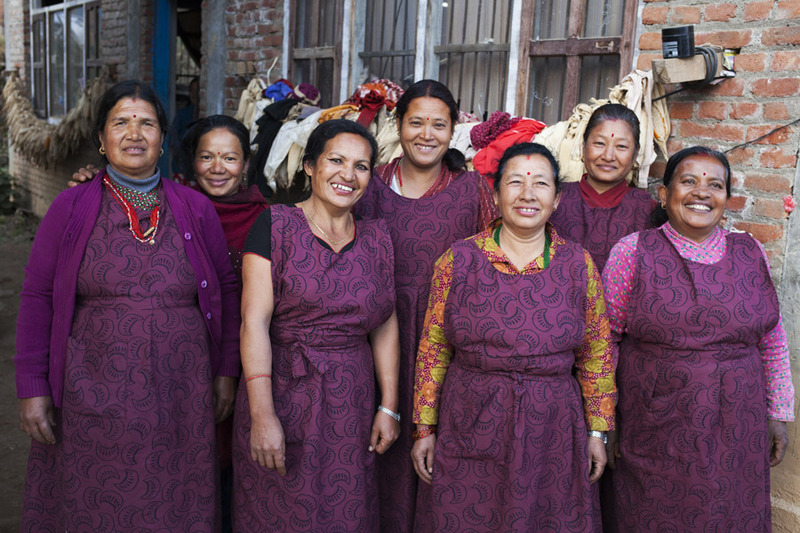 In total, nine women are currently working with her on different traditional Nepali fabrics and clothes. “One sister-in-law didn’t even know what thread was and another one didn’t know what weaving from the thread was. But I convinced them that we had to learn, that this was our way of earning income, and now both are doing good work and I am happy about that”, she says. As well as destroying and damaging homes, 2015 Nepal earthquake also severely impacted employment and swiped livelihoods. Durga was one of the many people who lost their farming tools, machines, access to markets and, consequently, businesses. After the earthquake, Durga received support from ACP (an Oxfam local partner) in reconstructing her workshop, repairing and maintaining her and her family’s homes, skill training and social benefits like a medical allowance and an educational scholarship for their children. Since 2016, Oxfam’s Sustainable Livelihoods Support for Earthquake Affected Families in Nepal (carried out through Fair Trade Group Nepal – where ACP belongs to -) helped improve livelihood and economic opportunities of 4,500 (60% women) earthquake-affected families in five affected districts: Sindhupalchowk, Nuwakot, Kathmandu, Bhaktapur, and Lalitpur. Thanks to this project, entrepreneur women such as Durga have received equipment, tools and acquired the needed skills to start a new business, which generates sustainable income through the promotion of fair trade. Some of their products are available in Oxfam Shops worldwide. "Because of this support for my business, we have been able to have two meals a day. Without work, we wouldn't be able to feed ourselves. So I am really grateful", says Durga.